Initially published in French under the title Operation Nemesis, this revealing work is now available to the English-speaking public for the first time. It ranks as a major revision in the historic study of the Armenian resistance to the Ottoman genocide of Armenians.Operation Nemesis is a study of the Armenian Revolutionary Federation (the Tashnak Party) and the individuals responsible for the execution of Turkish leaders. Until Derogy's book, it had been assumed that the assassins were acting out of personal and emotional motives. 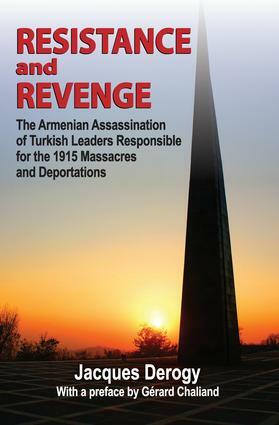 But through an amazing amount of detective work, it becomes clear that they were in fact part of a disciplined effort to seek retribution for historic crimes against the Armenian people.The work richly details Turkish plans for the liquidation of the Armenian people, the individuals selected to liquidate the genocidists, and above all, and most complex, to document for the first time the role of the organized Armenian political opposition to Turkish rule. In doing so, Derogy brings to light the relation between the legal party and its extra-legal arm; the mechanisms needed to implement the daring plan of assassination; and the special postwar circumstances in which the Armenian nation found itself - torn asunder by a Turkish-Soviet detente in which the independence of Armenia became the sacrificial pawn.Derogy worked closely with scholars around the world, and interviewed firsthand remaining survivors who had direct contact with the events described. His is a detective story of the first rank, no less than a piece of historical reconstruction with obvious portent for current Armenian efforts to recapture political legitimacy and personal pride.